Argan oil is a very popular cosmetic oil, most frequently used for hair care. It absorbs fast, has delicate and pleasing scent, but also conditions hair, moisturises and deeply nourishes. It protects hair and scalp against mechanical damages, so is used to strengthen hair before blow drying, straightening or curling. On top of that, argan oil protects hair against harmful impact of sun radiation and freeze. It will take care of scalp by balancing the sebum secretion on its surface. Argan oil contains also rejuvenating properties. It prevents premature grey hair and makes hair stop falling out. 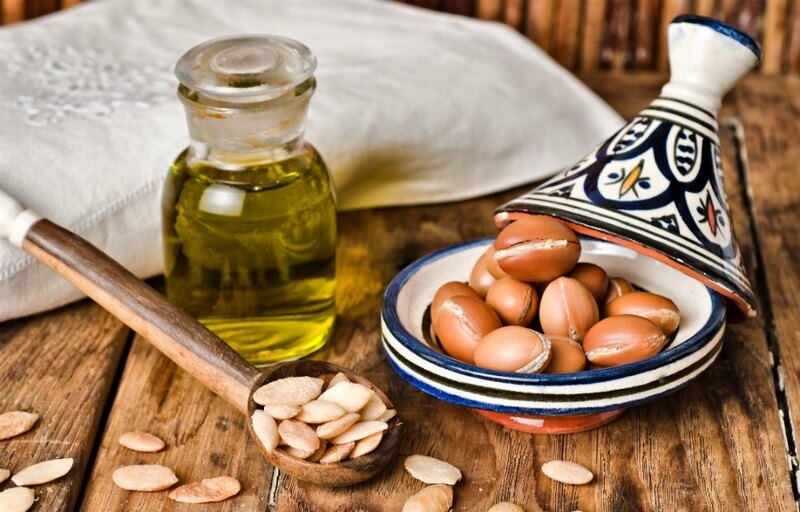 There is a good reason for calling argan oil “wrinkles iron” – its regular use can flatten them and prevent new one. Women who desire to grow long hair are also very keen on use argan oil. After all, it speeds up hair growth with its ability to penetrate hair bulbs and strengthen them. Healthy hair bulbs improve growth of strong strands. As you can see – argan oil has only pluses. What is more, this oil is natural, so it does not trigger allergies and its use is related to no risk. It will not damage hair because it doesn’t contain parabens, silicones or any chemical substances that could disrupt processes on the scalp and the structure of hair. Another indisputable advantage of argan oil is the content of fatty acids that matches almost every hair types. It contains 50% of oleic acid from omega-9 group (its particles match medium porosity hair), and around 36% of linoleic acid in omega-6 group (its particles match perfectly high porosity hair). Medium porosity hair are the most popular, the majority of population have them – these are hair that are somewhere in between healthy, thick and heavy hair with low porosity and damaged, fine, matte, rough and brittle hair with high porosity. Often happens that medium porosity hair have worse condition at ends (these are more dry, damaged and matte). Therefore, argan oil – due to proportional amount of fatty acids with various particles size can match both medium porosity hair and a bit more damaged hair with high porosity (and more raised cuticles). For this reason it becomes almost universal cosmetic – stay away from it should only ladies with low porosity hair, which are healthy. It is because particles of argan oil can weight down this hair type.